1 of 4 Add 4 cups ice cubes to a large bowl and fill with water to make an ice bath. Set aside. 2 of 4 In a medium pot over medium, bring heavy cream, honey and vanilla to a simmer. 3 of 4 In a medium bowl, whisk milk and gelatin. While whisking milk mixture, add in 1/4 of the hot cream mixture. Whisk tempered mixture back into pot. Cool pot in ice bath. 4 of 4 Once cool, pour panna cotta mixture into four 4 oz ramekins. Place on a tray and refrigerate until firm, about 1 hour. 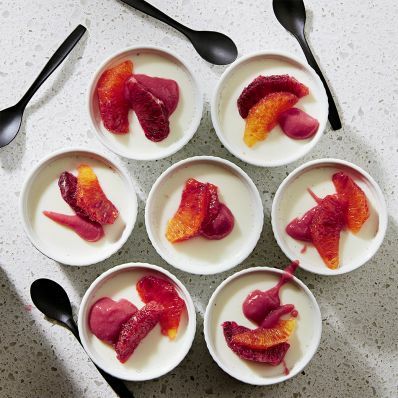 Garnish with Guava-Raspberry Puree and Blood Orange Segments.